Drive-thru garage plans are available in a variety of sizes and styles included single and tandem bays as well and simple designs and more complex plans with a loft or storage space above. The rear overhead door makes it easy to access items at the back of the garage, such as the riding lawn mower or leaf blower, without having to back the cars out just to get to it. On the right lot or property, the drive-thru garage bay eliminates the hassle of back in or out of your garage. You can simply pull straight thru instead. If you wish to store a boat or trailer, simply pull into the garage with your truck, pull thru leaving the boat or trailer centered in the garage bay. Unhitch the boat or trailer and close the door. When it comes time to access the boat or trailer later, back your truck up to the garage door, hitch to the boat or trailer and pull away. There is no need to back the boat or trailer in and out of the garage any longer. Drive-thru RV garage plans are a dream-come-true for RV and camper owners. It is already challenging enough to drive such a huge vehicle, so you’ll appreciate the convenience of a drive-thru RV garage eliminating the hassle and frustration of trying to back the RV in or out of the garage. A drive-thru garage plan with the rear door opening to the backyard works well for families with small children. The kids can access bikes and toys inside from the safety of the backyard without having to go to the front of the garage or driveway near the street. 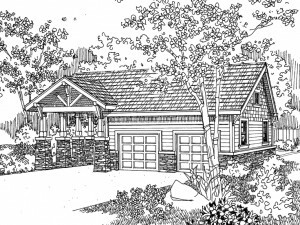 Practical and convenient, there are many other good reasons to build a drive-thru garage plan. Take some time to check out The Garage Plan Shop’s collection of drive-thru designs.